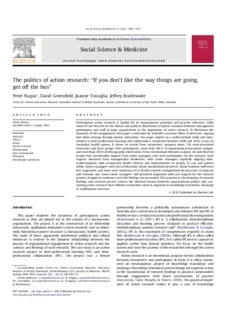 Participatory action research is lauded for its emancipatory potential and practice relevance. Little research has focused on the ethical and political dimensions of power relations between management gatekeepers and staff in large organizations in the negotiation of action research. To illuminate the dynamics of this engagement, this paper is informed by Aristotle's practical ethics of phronesis, arguing that ethics emerge through human interaction. The paper reports on a multi-method study and intervention in inter-professional learning and collaboration, conducted between 2008 and 2010, across an Australian health system. It draws on results from researchers' progress notes, 139 semi-structured interviews and focus groups (492 participants), more than 200 h of organizational document analysis, and more than 200 h of ethnographic observation. From conventional thematic analysis, we note that the project had considerable support from senior managers who were gatekeepers for the research. Such support stemmed from managerialist tendencies, with senior managers explicitly aligning inter-professionalism with prospective health reforms and improvements to quality of care and patient safety. Senior managers were also enthusiastic about standardized processes. Many frontline staff were less supportive, and some were suspicious of or hostile towards management-led processes to improve and evaluate care. Some senior managers' self perceived alignment with and support for the research process changed to resistance once this finding was presented. This paradox in the interplay of research findings and research process evinces the inherent tension between organizational politics and conducting action research that reflexive researchers need to negotiate in knowledge translation, exchange or mobilization exercises.